Food works on many levels, basic fuel is only one of them. Mango, dragon fruit, pineapple and Santa Rosa plums conjure visions of sunny days on a lanai in Kauai. “Eat this, it’s make you more Jewish.” My first boss after college would say as she pushed another traditional Jewish treat across the table at me. I would happily comply; after all the food was inevitably delicious. Now decades later, I still have a craving for a good chewy bagel whenever I walk by a deli, and ah, those potato latkes! I have many fond memories of the bond we formed by sharing meals. Food is more than life sustaining; it’s emotionally connecting, healing and a source of cultural transmission and sociability. And food is oftentimes a source of comfort and nostalgia when we eat the treats we grew up enjoying. Today 20 percent of all meals in the USA are eaten in the car. The rituals, creativity and bonding experiences of preparing and sharing food that sustains our bodies and spirit are going the way of the once popular home fondue pot. The lack of complete nutrients, social, and spiritual nourishment from feeding our bodies fast food on the run leaves an unfilled hunger in us. This is one of the reasons we overeat -we are missing real sustenance. Our lives are now so packed with work, home, commuting and family demands that this basic nourishment need is neglected. How can we regain what we lost? We can recoup this essential human need in new ways that are more adapted to our hectic lives. 1. Have a sit down meal at least once a day for a minimum of half an hour. No phones or other electronic at the table please – once you adjust to the temporary electronic fast, you may find that you enjoy interacting with your meal mates and that you are developing connections and understanding that strengthen relationships. 2. Establish or revive traditions around food. Celebrate meaningful occasions with gatherings where people bring their favorite food to share, or better still, make food together as part of the festivities. This will help you form lasting connections and create flavorful memories for yourself and your loved ones. 3. Invite business colleague to a meal and spend the first ten minutes with your full attention on sharing about food, family, hobbies and other non-work subjects before you dive into work. Observe how that changes the openness to ideas and greater collaboration on both sides. 4. Plan a blind food tasting party with your friends and family. Lay out a variety of fruits and vegetables: carrots, celery, radish, jicama, cucumbers, apples, bananas, grapes, pears, bananas, kumquats, cherimoya, apples, pineapple, cherries, cherry tomatoes, raw nuts, etc. Eat each one individually with your eyes closed. You’ll be amazed to experience the number of aromas, flavors and textures that ordinarily you would have missed. Share what you discovered tasting common foods this way with the group and enjoy the fun you can have eating nutritious and delicious food. 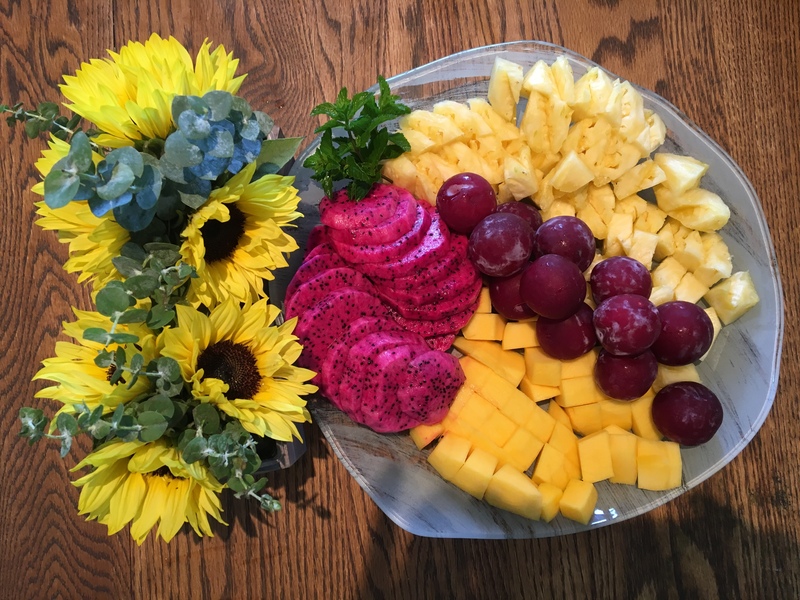 The above practices will help you shift from regarding food as only fuel to keep your body going, to appreciating the many facets of food as healing, soothing, community building, and just plain fun and delicious! Use this wonderful ritual of mealtime to nourish you on all levels. Happy eating! Don’t Just Feed Them. Nourish Them.